Employees of Key Fisheries, a Marathon, Fla. fish market that was damaged by Hurricane Irma, clean up debris. Their business is closed to the public due to all the damage done by the storm. In Everglades City, Fla., crab fishermen Shane Reamao, left, and Dalton Daffin hurry to repair a commercial fishing dock that was destroyed during Hurricane Irma. "Yesterday, from where I had my traps to where I found them, they were 7 miles away. And to travel around, and try to find a 7 and a half inch buoy in the Gulf of Mexico, is a challenge." It's a big loss, both for these fishermen and for the industry they drive. Spiny lobster is the most valuable commercial catch in Florida, amounting to some $40 million annually, and it's mostly fished here in the Keys. The commercial season to catch spiny lobster runs from early August through the end of March, but the majority of the catch happens during the first half of that span. In other words: This should be the heart of the season. But after Hurricane Irma, some lobstermen have lost up to 90 percent of their traps. Boat captain Ray Saldino says the storm, a Category 4 when it passed through, scattered them far and wide, and mangled them in the process. "They just don't scoot across the bottom and stay flat!" Saladino says with a laugh, pointing to damaged traps stacked on his boat. "You see some of them that are just torn apart on the top. It's all scuffed up, see that. That's flipped around, upside down, it's a mess." The traps wouldn't do much good now anyway. Standing by the meager catch he hauled in today, fisherman Alfaro Crespo says hurricanes also disperse lobsters. "It's a mess. Soon as the lobster recognize the weather: gone," says Crespo, with a snap of his fingers. Most lobster fishermen around here say they are packing it in for the season. In good years they might otherwise fish until Christmas. And many of them have lost more than their traps and their livelihood. "I'm sleeping on my boat, because I lost all the contents of my house as well," says Carlos Moreira, with a slight head shake. Moreira built a narrow bunk, padded with a hunk of foam, in the wheelhouse of his spartan fishing boat. At least he's got a place to stay in the Keys; others have had to move to the mainland. So labor is scarce, and lobsters are scarce. Boat owner Elizabeth Prieto says everyone around here feels it. "It takes from everybody," says Prieto, standing on the fishing dock. "It starts with the crew, and then the fishermen, and then there's the fish house, and then there's the restaurant, and then just boom, boom, boom, it's like a domino effect," she says. There is a bright spot though, or at least a shiny hope for this industry, and its epicenter is in a tiny town on the mainland, led by a jolly man in the fishing business. Howie Grimm introduces himself as "the mayor of Everglades City, the stone crab capital of the world." That may be an exaggeration, but it's probably fair to say that no place relies on stone crabs more than this little town — both in the fishery and the income from tourists the local delicacy brings to local restaurants. Everglades City is counting on the stone crab season even more than usual this year. The town took a direct hit from Hurricane Irma, including a storm surge that flooded neighborhoods with up to 10 feet of water in low-lying areas. Stone crabs aren't much to look at. Their bodies are about 6 inches wide and often kind of mud-colored. But they can grow big, tasty claws. A single claw can fetch a fisherman upwards of 20 dollars. And Howie Grimm thinks it's going to be a good crab season. "I think the water's fine," says Grimm. "I think it's going to be better than it was before." So people are racing to prepare for the first day they can start trying to catch crabs on Oct. 5. Half a block from Grimm stands a team of fishermen with an assembly line going, cleaning and refurbishing crab traps. In the same spot where Grimm's brother docks his crabbing boat, Ron Ouellette and a couple of crab fisherman are hustling to cobble together a dock battered by Irma. "We're trying to do a guerilla repair job," says Ouellette of the hasty work. "Eventually it will be rebuilt properly, but this is just to get this season in." Justin Grimm, Howie's son, runs a business buying, processing and selling crab. He's working furiously to rebuild that business, after 3 and a half feet of sea water flooded it during Irma. "We gotta go back to work," says the younger Grimm. "Just our one little facility here to open is going to mean jobs for about 40 guys, between the boats, the captains, the crewmen, the employees here. "So, it's a very big deal that we get up and running," he says. "It ain't just about us, it's about the community." Everglades City isn't the only community banking on a big crab harvest. It's the same in the Keys, where Ray Saladino is gearing up for an aggressive stone crab fishing season. "It's got to be huge, because that's where our income has got to come from," says Saladino. Saladino says the whole south Florida shellfish industry pouncing on stone crabs at once will put a lot of pressure on the crabs. He worries that if they are too plentiful, that healthy supply may depress the prices fisherman can get for the claws. But mainly, he just hopes there's enough of them to go around. 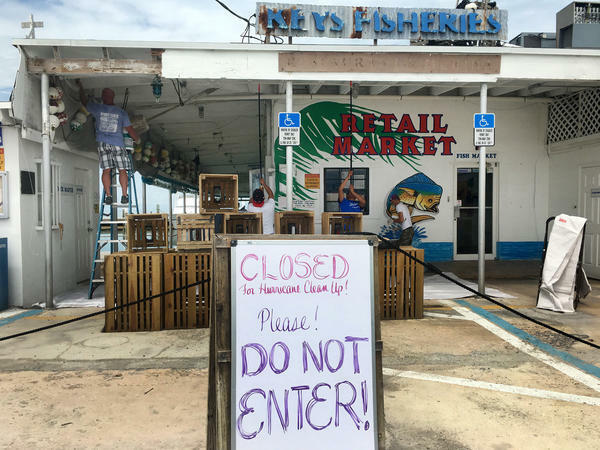 In Florida, Hurricane Irma upended a number of industries, including commercial fishing. It smashed equipment and left many fishermen homeless. Now, as NPR's Frank Morris reports, fishermen in South Florida are pinning their financial hopes on a different seafood delicacy. FRANK MORRIS, BYLINE: Here on Marathon, lobster boats are pulling up to the docks - same as usual afternoons this time of year. But instead of hauling in thousands of valuable lobsters, boat Captain Carlos Moreira has just been roaming the seas, searching for lost traps. CARLOS MOREIRA: Well, you've got to start somewhere. So you just look for one. Yesterday, from where I had my traps to where I found them, they were seven miles away. And, you know, to travel around and try to find a 7-and-a-half-inch buoy in the Gulf of Mexico is a challenge. MORRIS: Some lobster fishermen say they've lost 90 percent of their traps. Boat Captain Ray Saladino says Irma, Category 4 storm here, scattered them far and wide. RAY SALADINO: They don't just scoot across the bottom and stay flat. You see some of them that are just torn apart on the top. It's all scuffed up right here. See that? That's been flipped around, upside down, right side up. It's a mess. MORRIS: The traps aren't going to do them much good now, anyhow. Standing by the meager catch he hauled in today, Alfaro Crespo says hurricanes disperse lobsters. ALFARO CRESPO: It's a mess. Soon as the lobsters recognize the weather - gone. MORRIS: Most lobster fishermen around here are packing it in for the season. In good years, they might otherwise fish until Christmas. And quite a few of them lost more than their traps and their livelihood. MOREIRA: I'm sleeping on my boat because I lost all the contents of my house, as well. But we ain't going nowhere. We're going to hang in there. MORRIS: Carlos Moreira built a narrow bunk padded with a hunk of foam in the wheelhouse in his Spartan fishing boat. At least he's got a place to stay in the Keys. Others have had to move to the mainland. So labor is scarce. Lobsters are scarce. And boat owner Elizabeth Prieto says everyone around here feels it. ELIZABETH PRIETO: It takes from everybody. It starts with the crew and then the fishermen. And then there's the fish house. And then there's the restaurants. And, I mean, it just - boom, boom, boom - it's like a domino effect. MORRIS: There is a bright spot, though, or at least the shiny hope for this industry. And its epicenter is in a tiny town on the mainland. HOWIE GRIMM: Hi. My name's Howie Grimm. I'm the mayor of Everglades City, which is the stone crab capital of the world. H GRIMM: Of the world - because they don't have them anywhere else but here. MORRIS: Grimm's exaggerating a bit there. But it's probably fair to say that no place relies on stone crab more than this hard-hit little town. Stone crabs aren't much to look at. Their bodies - they're about 6 inches across, often kind of mud colored. But they can grow big, tasty claws. A single claw can fetch a fisherman upwards of $20. And Grimm thinks it's going to be a good crab season. H GRIMM: Yeah, yeah, yeah. I think the water's fine. I think it's going be better than it was before. MORRIS: And people are racing to get ready for the first day of legal crab fishing next week. 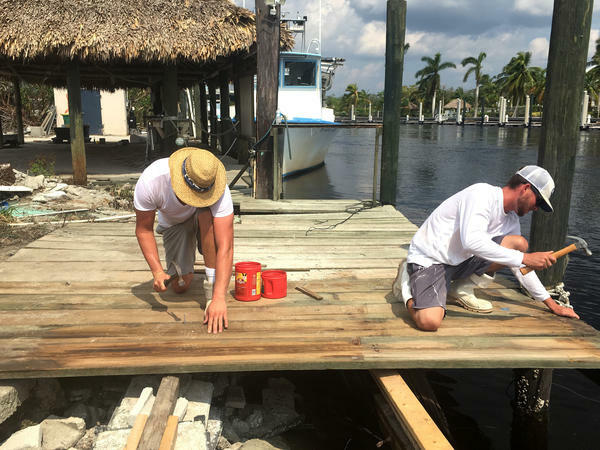 Ron Ouellette and a couple of crab fishermen are hustling to cobble together a dock that was battered by Irma. RON OUELLETTE: We're trying to do a guerilla repair job. Eventually, it will be rebuilt properly. But this is just to get this season in. MORRIS: And there's a lot riding on it. Justin Grimm, Howie's son, runs a business buying, processing and selling crab. JUSTIN GRIMM: But we've got to go back to work. I mean, just our one little facility here to open is going to mean jobs for about 40 guys, between the boats, the captains, the crewmen, employees here. So it's a very big deal that we get up and running. It ain't just about us. It's about the community. MORRIS: Everglades City isn't the only place banking on a big crab harvest. Back in the Keys, boat captains like Ray Saladino are, too. SALADINO: It's got to be huge because that's where our income has got to come from. MORRIS: Saladino says that, with almost all local fishermen turning away from lobster now, they are ramping up to catch stone crabs. He just hopes there's enough of them to go around. For NPR News, I'm Frank Morris in Marathon, Fla. Transcript provided by NPR, Copyright NPR.